Over fourteen years ago, a small community in the Victorian Central Goldfields, dreamed of sharing it’s tiny heritage town with thousands of visitors and giving local farmers, growers and makers an opportunity to sell their organic, bio-dynamic, artisan and local produce direct to the public. The Talbot Farmers Market was created, providing locals and visitors fresh produce, variety and an alternative to large multi-national food producers. The buy local movement was growing momentum and entrepreneurial small-scale producers were looking for new opportunities. Today, the Talbot Farmers Market attracts thousands of visitors, every third Sunday of the month and the entrepreneurial spirit has blossomed, leading to collaborations between some of the long-term stall holders, many using each other’s produce to value add, creating new products for customers. Stony Creek Oil Company, located just up the road from Talbot operates it’s family business on it’s fourth generation farm. A long-term stallholder at the Talbot Farmers Market, Fred and Coral Davies sell their range of cold-pressed oils and have become leaders in producing premium quality, certified organic Flaxseed Oil, Meal and Flour. Having recently decided to concentrate on the cold-pressing of oil, the Davies no longer grow flax on their farm, rather they source high quality and organic produce from other growers. The Stoney Creek Grape Seed Oil uses seed from Amherst Winery, a long-term stall holder and award-winning local winery. A new collaboration has recently taken place between Jeff Hooley, stallholder from Xanna Soap and Fred Davies to create a new hemp seed handmade soap, which was trialed at the last Talbot Farmers Market, in September. Stoney Creek Oil has recently started producing and selling hemp seed oil as restrictions on this crop are being lifted. With high levels of Omega 6 and Omega 3, hemp seeds are also a good source of protein and insoluble fibre. 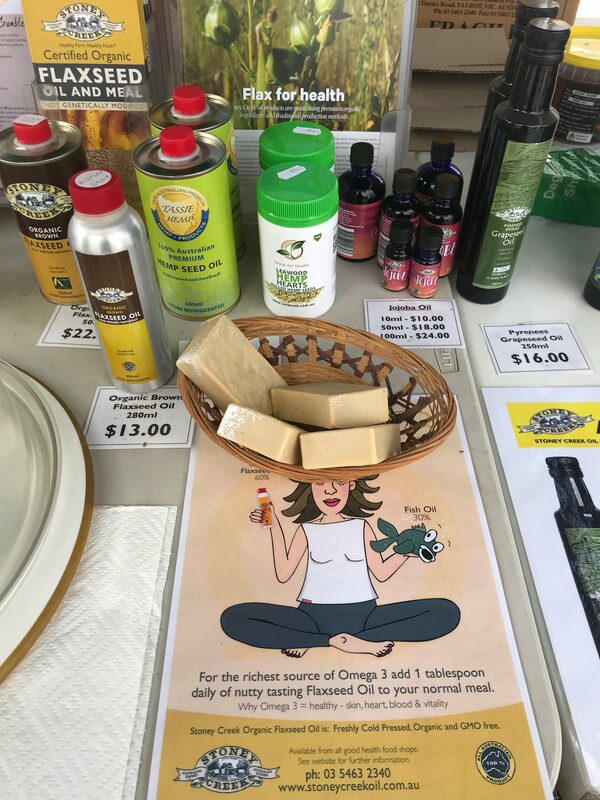 Jeff Hooley has been making and experimenting with natural soap making with 100% olive oil since 1998 and spoke to Davies about a possible collaboration to create soap from the hemp oil that Stony Creek Oil was extracting. While the product needs refining, the first batch was successful and there are plans to produce more soap in the future. With a focus on protein rich and healthy natural products, this handmade approach to developing products is innovative and collaborative in a way that is unique to the country. Talbot Farmers Market continues to invite new stall holders who are providing and producing artisan and local produce, with a preference for organic or free range. Markets are the ideal platform for entrepreneurial and start-up food producers to get immediate feedback on their products so they can respond swiftly to customers preferences and tastes. ‘All profits from the sale of Wimmera Flour at the August Talbot Farmers Market will be donated to the NSW Farmers Drought’, say sisters Pam and Jenny Gaulke from Wimmera Flour. Growing up with second and third generation farmers, sisters Jenny and Pam Gaulke know the challenges of making a living from the land. Located on a property in Wonwondah VIC in the Horsham Shire, these innovative producers are keen to support the farmers in NSW who are struggling from persistent drought. 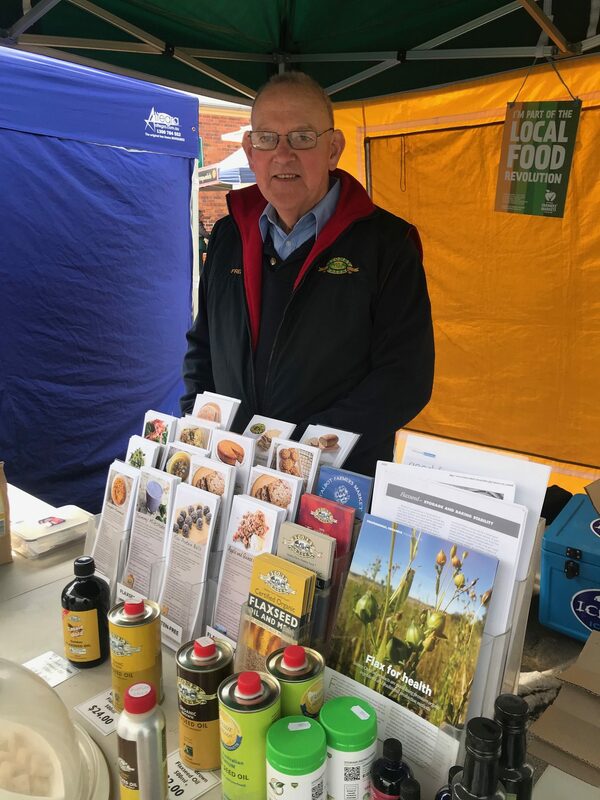 While many NSW farmers are being forced to sell their stock and are desperate to find feed, the sisters who produce Wimmera Flour will donate profits from sales made at the next 19 August, Talbot Farmers Markets to the NSW Farmers Drought Relief. Wimmera Flour is an organic stone ground flour, made from wheat farmed on an organic broad acre farm in nearby Tarranyurk. The venture was an ambition to make locally produced flour products from small scale operations, giving wheat farmers, restaurateurs and home cooks, alternatives to the big multi-national brands. Buying directly from Jenny and Pam, consumers know that the flour is hand-made and fresh, with a distinct flavour of the region. They support their local farmer by finding new markets to sell their bespoke product. Braving the heat, wind and rain, Pam and Jenny attend a local market most weekends and enjoy sharing the story of their unique flour to inquisitive foodies. The flour is currently made in small batches on the farm, but the sisters have big ambitions to create a co-op of local farmers to sell their local product to interested foodies and restaurateurs. While Jenny and Pam sell their flour at the Talbot Farmers Market, they are keen to let more people know about their product, how to use it and why it is special. Jenny says” you can use Wimmera Flour in any wholemeal flour recipe, creating special banana breads, scones, lemon cake and specialty breads.” For the home cook who loves to bake their own bread, Wimmera Flour will create a beautiful distinct flavour in your next loaf. For restaurateurs, commercial chefs and café owners, Wimmera Flour can add a uniqueness to lavash bread and other baked products. You can find Jenny and Pam at the next Talbot Farmers Market on Sunday 19 August from 9am – 1pm. The little Wimmera Flour stall is located on Camp Street, Talbot, just outside the Figtree Café building. Every third Sunday of the month, the tiny heritage town of Talbot is transformed into a bustling hive of activity as people travel to buy direct from their local farmers, growers and producers. With over 80 stalls of fresh, organic and bio-dynamic products from honey, bread, fruit and vegetables, meat, sauces, oils, preserved goods, handmade herbal teas, soaps, wine and cheeses, you can also buy your live chickens, stock feed and plants. The unique quality of the Talbot Farmers Market is that it runs alongside the Talbot Hall Markets where there are another 50 stalls offering brique-a-brac, handmade arts and crafts, tools and all sorts of gifts, lotions and potions. Together, these two markets provide local people the opportunity to make and sell their produce directly to the public at a very low cost. This gives farmers, hobbyists, small scale growers and makers a platform to sell what’s in season and bring directly to the people. Customers are able to meet the makers and find out about products, often tasting them before they buy, which is not possible at the supermarket. Meet two of our stall holders below. Every month we welcome new stall holders as different products come into season. Adam Court from Gorgeous George Probiotics is one of the Talbot Famers Markets’ newest stall holders. Gorgeous George Probiotics only sell their range of probiotic gut healthy products like Kombucha, sauerkraut, dips, hummus and tzatziki at local markets as it allows them to manage the quality of their product. Adam says, “the markets give us the ability to meet our customers and find out exactly what they think of our products. This was important when we were starting out as it gave us the freedom to experiment with our products and get them right for the customer. We could play with the flavours and educate people on new products like the fermented tea drink, Kombucha.” Kombucha is now their bestselling product, with people enjoying the healthy qualities of the tonic. There are other stall holders who have been with the Talbot Farmers Markets since the beginning, over 14 years. Avonmore Estate is a bio-dynamic farm, vineyard and Bed and Breakfast, just north of Bendigo. They have been selling their biodynamic wines and grape juice for years and rarely miss a market. Farmer, Rob Bryans enjoys meeting his customers at the Talbot Farmers Market. “We sell our wines in other outlets as well as online, but it is the farmers markets that gives us the opportunity to discuss our wines directly with the customers”, says Rob. People can try the wine before they buy, so they know they are going to like it before they take it home. Rob can also talk to people about the differences of bio-dynamic farming and what that means to their wines. So, rug up your family and four-legged friends, pack your environmentally friendly bags and take a trip to the country this Sunday and visit the Talbot Farmers Markets 15 July, from 9am to 1pm. There are hot food stalls and plenty of coffee carts to keep you going. The tiny town of Talbot boasts an authentic country farmers’ market experience, with real livestock, real produce, real farmers and real community spirit. On market day the town centre is closed to passing traffic, the streets are lined with market stalls and the whole town becomes a vibrant village marketplace. 1000’s of visitors flock to Talbot to wander the beautiful heritage village and explore over 80 regional produce and artisan food stalls, offering seasonal fruit and organic vegetables, local milk, artisan cheese, fresh bread, regional wine, gourmet oils, delicious delicacies and more. In true country farmers’ market style visitors to Talbot will also find farm animals, stockfeed, cut flowers, plants and seedlings. Live music can be heard in streets along with cheerful greetings from friends and stallholders as they pass each other on their monthly visit to the farmers’ market. First stop for many is to one of the coffee vendors before setting off to fill their shopping bags with groceries, then to forage for a yummy breakfast and lunch in the open air food court. A highlight of any visit to the Talbot Farmers’ Market is the chance to win the famous Barrow Raffle. Each month the purple wheelbarrow is wheeled through the crowds by market volunteers collecting produce and gourmet products, all kindly donated by the stall holders. The raffle is drawn at 12:30pm on market day and one lucky ticket holder takes home the entire contents of the barrow, whilst all ticket sale proceeds go towards the ongoing running costs of the farmers’ market and to support local community groups. In season: Spring is a busy time in the nursery, more people get out into the garden as the weather warms up and they are looking to purchase new season seedlings and plants. The warmer weather and longer days mean the plants grow quicker so there is a faster turn around between planting the seed or striking the cutting and having the plant ready to sell. About Talbot Railway Station Nursery: Each month Ralph pushes his plant cart from his nursery at the nearby Talbot Railway Station to set up stall on Scandinavian Crescent, in the heart of the farmers’ market. Here he sells a range of drought hardy plants including many varieties of suculants. Ralph strikes many of his plants from cuttings which are hardy and well suited to local conditions. Ralph is a wealth of information and many regular market goers make a stop at Ralph’s stall to seek advice and chat about particular plants and their gardens. Spring time sees an increase in milk production as the days get longer, warmer and more grass grows. More milk means more work in the dairy to process all the milk. All the milk is required to be pasteurised, this is done by passing the milk through tubes to 76C, held at that temperature for 15 seconds, before chilled to 3.2C. Some products are homogenised and some run through a separator. In total their daily production is about 1000 litres of full-cream unhomogenised milk, 3000 litres full-cream homogenised milk, 2500 litres low-fat milk and 200 litres of cream. About Inglenook Dairy: Inglenook Dairy is a family owned business established in 2011 by Troy and Rachel Peterken. Rachael’s grandmother first settled on the farm in the early 1900s. with six cows and no land and grew it to 20 cows and 20 acres. The Inglenook Dairy farm, located in Dunnstown near Ballarat, now runs about 250 cows on 400ha. 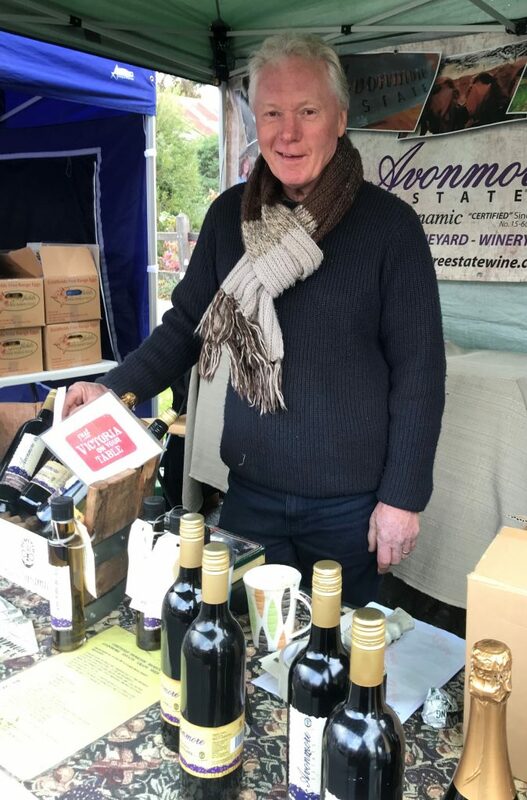 Inglenook Dairy have been attending the Talbot Farmers Market for over three years selling coffee, milkshakes and their own fresh milk and cream direct from the farm dairy. Just recently they have began producing their own yoghurt product which is proving very popular with customers. Visitors to Talbot love that Inglenook Dairy offer an unhomogenised milk which has the ‘cream top’ they remember milk having from their childhood. Aside from running their own coffee stall at the Talbot Farmers Market, Troy & Rachael of Inglenook Dairy supply to many local cafes and their milk is highly regarded by baristas. Care is taken on the farm to ensure the correct level of proteins and fats are present in the milk, as if the protein isn’t 3 per cent as a minimum it won’t froth as desired for making coffee. This is done through careful grazing on a mixed pasture of canola, clover and rye grasses and supplementary feed if required. Spring time at the Talbot Farmers Market is an exciting time as we emerge from the winter chill and embrace all that the new season has to offer. As the weather warms up both plants and animals spring to life, it is a time to get out in the garden and get planting and to enjoy the bounty of fresh produce the season brings. The Talbot Farmers Market is held on the third Sunday every month, Scandinavian Crescent and Camp Street Talbot, from 9am until 1pm. Talbot’s hugely successful farmers market will host a, special market event this Sunday in celebration of it’s 13th anniversary market. On the third Sunday of the month for the past 13 years the town of Talbot has transformed into a vibrant village market place. In the early hours of the morning farmers, bakers and gourmet product makers gather in Talbot to set up stall over 80 stalls and await the crowds to arrive, and arrive they do, in droves. “There is always a buzz in the air on market day, visitors love to soak up the atmosphere as they wander along the beautiful heritage streetscape bustling with market stalls.” said the markets Marketing Officer Jayne Newgreen. Talbot Farmers’ Market was founded in 2004 with a barrow load of dedication from a group of passionate locals and seed seed funding from Victoria’s Department of Regional Development. The aim was to stem the demise of the small town and create a monthly event which would allow the economic and physical health of the town and its people to flourish. “The market has always been more than a place to shop for fresh seasonal produce,” Jayne explains. “It is a place for locals to catch up with one another and people from further afield to visit and experience an authentic country farmers market with real livestock, real farmers and real community spirit. For many a chance to win the unique and quirky Barrow Raffle is a highlight of each farmers’ market day. Every month the purple wheelbarrow is loaded with produce and products donated by the markets generous stall holders, at 12:30pm the raffle is drawn and one lucky ticker holder wins the entire contents of the wheelbarrow, estimated at over $250 worth in products. This month however, in celebration of the markets 13th anniversary, the farmers market committee will donate a brand new wheelbarrow to be part of the prize along with all of the wonderful produce and products donated by stall holders. Funds raised through the Barrow Raffle go towards the ongoing running costs of the market and back into the local community. Over the past year the Talbot Farmers Market has made donations to the Maryborough SES, Talbot Action Inc and the Talbot Primary School. The extra special Barrow Raffle is just one reason to get along to this months farmers’ market this Sunday, many of the markets 80 stalls will also have anniversary specials, making it a market event not to be missed. Scandinavian Crescent & Camp Street, Talbot. Barrow Raffle tickets are available from the purple Information Marquee in front of London House on Scandinavian Crescent, the raffle is drawn at 12:30pm each market day. They are collecting donated produce and products from each of the markets stallholders to go towards the famous monthly Barrow Raffle. “Our stall holders are fantastic” says Marketing Officer Jayne Newgreen. “Not only are they extremely generous with their donations to the Barrow Raffle each month, they are really friendly and provide the market with an inviting community atmosphere”. Just after midday the crowds gather in front of London House, raffle tickets in hand, hoping to be the lucky winner. While there is only one lucky raffle ticket holder each market the Barrow Raffle gives so much more, to the farmers market, the stall holders and the local community. The Barrow Raffle provides stall holders an opportunity to showcase their products and the Farmers Market an opportunity to raise important funds to cover its ongoing running costs and put back into the local community. Over the years Talbot Farmers Market has donated monies raised to local community groups as a token of appreciation for having the market literally take over the town each month, and to support the good work of others in the community. Recipients of these funds in the past have been the Talbot CFA, Talbot Medical Car and the Talbot Primary School RACV Energy Breakthrough. On the third Sunday in August, Talbot Farmers Market president Lindsay Hazelman and vice-president John Wright presented a $500 cheque to Maryborough SES Unit Controller Jesse Wright, recognising the great work that the group does for the local community at times of need. The Victoria State Emergency Service (VicSES) works to ensure the safety of Victorian communities by responding to emergencies and disasters across the state. Just last week, as the wild weather and heavy rainfall hit our region, the Maryborough SES was called out to assist at a home in Talbot that was experiencing inundation. The Talbot Farmers Market decision to donate to this worthy cause was, in part due to recent changes to funding for the Maryborough SES, which has seen the local shire council withdraw their part of the subsidy. This subsidy had been provided to the SES and relied upon for many years. In fact, during his more than 35 years with the SES, Jesse could not recall a time that they were not supported by the local shire. “There is always a need to upgrade and maintain equipment and vehicles” said Jesse, appreciative of the much needed funds. Without the local shire council subsidies the Maryborough SES is in danger of having to dip into their savings which are reserved for major equipment upgrades. Donations such as that received by the Talbot Farmers Market help to ease the pressure on these funds. A VIBRANT VILLAGE MARKET CELEBRATES 12 YEARS! On the third Sunday of every month for the past 12 years the town of Talbot has transformed into a vibrant village market place. Every month farmers, bakers and gourmet product makers gather in Talbot to set up stall and await the crowds to arrive, and arrive they do, in droves. “There is always a buzz in the air on market day, visitors love to soak up the atmosphere as they wander along the beautiful heritage streetscape bustling with market stalls.” said Marketing Officer Jayne Newgreen . Talbot Farmers’ Market was founded in 2004 with seed funding from Victoria’s Department of Regional Development, plus a barrow load of dedication from a group of passionate locals. Their aim was to stem the demise of the small town and create a monthly event which would allow the economic and physical health of the town and its people to flourish. It is this community spirit that Market Co-Ordinator Lee Holland sees as one of the main reason for the markets’ ongoing success. “It’s been yet another amazing year for the Talbot Famers Market.” she said. A highlight for the Talbot Farmers Market during the year was its inclusion in an article “7 Markets you will Love to Discover in Victoria” as compiled by the Herald Sun. The Talbot Farmers’ Market was ranked in at number two, which for a tiny town of about 350 residents is a huge achievement. One of the many stall holders who attends the monthly market is John Wright, a local pig farmer. 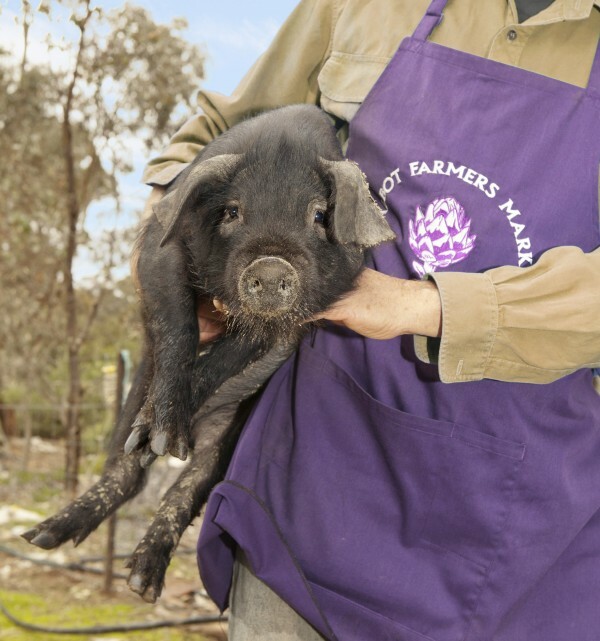 John has been loading up the trailer and taking his rare breed Large Black pigs to the Talbot Farmers’ Markets for almost all of the markets 12 year history. Following research into the many various breeds of pig John came across the Large Black, originating from Great Britain. “The breed is more docile, hardy and very adaptable to the outdoors” said John. Further rare breeds such as the Large Black “need to be nurtured and preserved” explains John of his decision to raise the Large Black pigs. In celebration of the markets’ 12th anniversary milestone John will give visitors a chance to win one of his rare breed pigs this month. The winner of the “Pig Raffle” will have the choice between taking home a little piglet to raise or a young boar whose future is set to ensure the breed lives on. John is not the only stall holder getting into the celebratory spirit, many of the markets stalls will have Anniversary Specials this month, making it a market event not to be missed. Farmers’ Market Set to Celebrate! The town of Talbot will burst into life once again on Sunday 15th of March as the hugely popular Talbot Farmers’ Market celebrates it’s 11th anniversary market. For over a decade farmers, bakers, makers and growers have gathered on the third Sunday of every month to set up stall in the beautiful heritage precinct of Talbot. From near and far visitors descend upon Talbot, friends and families stroll the streets together, shopping bags slung over their shoulders ready to be filled with fresh locally grown goodies and gourmet products direct from producers. One of the founding group that brought the market to life is Tiffany Titshall. A fine artist, designer and passionate foodie Tiffany’s contribution to the markets success ranged from early mornings setting up roadside signs to designing the markets beautiful artichoke logo, which has become synonymous with the Talbot Farmers’ Market. “I visit Talbot Farmers’ Market every month,” says Tiffany. “I never miss coffee and yum cha whilst picking up fresh veg and bread. I love to take weekend guests to the market. The town charms them and the size and quality of the market surprises them”. “I love the atmosphere of the market – the music, the people and the variety of stalls.” Tiffany goes on to say. “As a designer I particularly appreciate the attention to detail, quality and style that new food producers present in their branding, and to see that flanked with straw, chooks and veg straight from the soil in the back of a truck is the best of everything to me”. Reflecting on how the market has changed over the past 11 years Tiffany says “The market has certainly evolved. It has grown and spread along Talbot’s streets and the crowds have followed. I am proud of the role I played when I see the market flourishing. I am always looking forward to what’s on offer next month”. 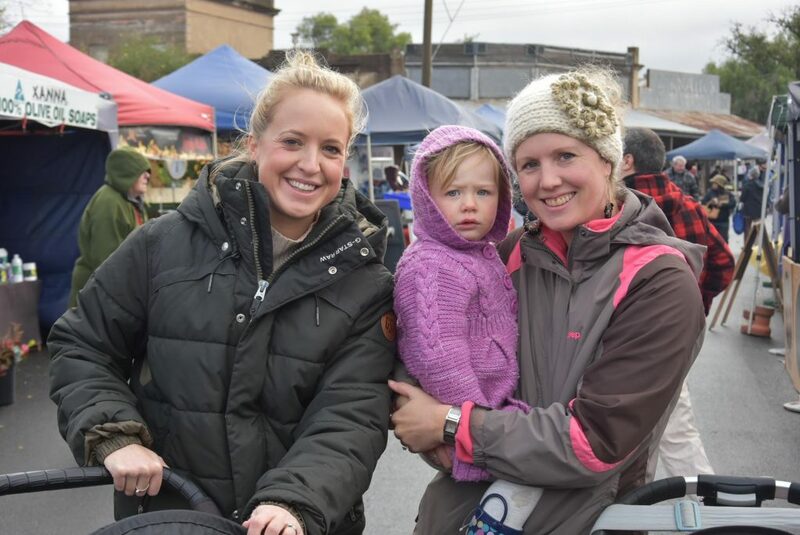 The ongoing success and longevity of the Talbot Farmers’ Market can be attributed to many factors, including the passionate local volunteers who work tirelessly to make the market happen each month together with two part-time employees who co-ordinate and promote the market. The market would not be possible without the customers who choose to come along and support local farmers and of course the passionate producers, who attend the market every month with their produce proudly presented on the market stall tables. Long time stall holder Frank sells stone-fruit, tomatoes, grapes and cherries seasonally at the market and while he could sell all of his produce at the farm gate he still chooses to attend the Talbot Farmers’ Market when the fruit is in season. “My customers wouldn’t let me get away with not attending the market” says Frank with a smile on his face, giving you the impression he would miss catching up with old friends and customers as much as they would miss buying his fruit. “A day at the Talbot Farmers’ Market is not complete without picking up a raffle ticket for your chance to win the popular ‘Barrow Raffle’,” says Lee Holland, the markets Co-Ordinator. The wheel barrow overflows each month with produce and products, kindly donated by the stall holders. John Wright sells his rare breed Large Black pigs at the market and will this month donate a pig to the hugely popular Pig Raffle. Raffle tickets are just $2 each and are available from the information marquee in front of London House on Scandinavian Crescent. To complete the vibrant village atmosphere live music is played in the streets on market day, this month local musician Kim Ritchie will entertain the crowds. Although blind since birth, through her passion for singing and enjoyment in sharing her love of music with others Kim has become a very accomplished entertainer. Come along to Talbot on Sunday 15th of March (9am -1pm) and share in the celebration of the milestone market day! The roads are closed off, marquees go up and visitors arrive, it’s market day and with the Farmers’ Market now in it’s 11th year this is not an unfamiliar scene for the residents of Talbot. The Farmers’ Market began in 2004 when a dedicated group of locals came together with the aim of bringing economic, social and health benefits to the Streets of Talbot. Over the years the Farmers’ Market has proven to be a great success, attracting many visitors to town, providing a social setting for locals to catch up and bringing fresh food to the streets of Talbot. As a not for profit community organisation the Farmers’ Market has also given back to the community that has supported it through donations over the years to the TTT Medical Car, Talbot Primary School, Talbot Tennis Club & Back Creek Kindergarten among others. Since 2004 the Committee of Management has evolved as people have moved on and new community members have come on board, passionate about being involved and working towards achieving those same aims of the its founders. Today the committee understands that in order to continue the success of the Talbot Farmers’ Market it is crucial that new people join the committee and help the Farmers’ Market evolve, set direction and prosper in the next decade. The Talbot Farmers’ Market will hold its AGM on Monday 10th November, 7:30pm at the Talbot Tennis Clubrooms. We invite residents of Talbot and surrounding districts to come along to the AGM and consider taking a place on the Talbot Farmers’ Market committee. Do you have an interest in farming and agriculture? Are you passionate about local food? Would you like to be involved in this celebrated community event? If so we would love to hear from you. Please get in touch via email to talbotfarmersmarket@bigpond.com or just come along to the AGM. The Talbot Farmers’ Market is a not for profit community organisation, administered by a Committee of Management which employs the services of two contractors to co-ordinate and publicise the Market and who together with a team of valuable ‘behind the scenes’ volunteers put on the Farmers’ Market each month. If you are interested in being involved but do not wish to be on the committee we would still love to hear from you. There is a real need for volunteer assistance on Market day with set-up, pack-down or general duties so please get in touch and we can discuss how you could become involved. Talbot Farmers’ Market AGM – Monday 10th November, 7:30pm at the Talbot Tennis Club Rooms. Followed by a light supper. This months Talbot Farmers’ Market offered a few more jams than usual, as thousands of people packed the historic streets of Talbot to celebrate the Markets’ 10th anniversary celebrations on Sunday. The tiny town of Talbot came alive with the sounds of local musician Kim Ritchie singing in the street and sharing her humorous quick wit between songs and also a series of short ‘Meet the Farmer’ talks drawing a crowd. A busker all the way from Melbourne played around the corner in Camp Street pleasing crowds with his guitar skill and stunning songs. Many stopped to listen, quickly realising he was in fact Ross Hannaford, a band member of “Daddy Cool” fame. Stall holders lined Scandinavian Crescent and spilled down Camp Street with many offering 10th anniversary specials. Market goers with calico shopping bags over their shoulders strolled the streets enjoying offerings of food, wine and organic beer tasting while filling their bags with purchases of fresh produce and local gourmet delicacies. Both the Barrow Raffle and Pig Raffle tickets were in demand with market goers vying for a chance to win one of the many prizes on offer, such as luxury overnight accommodation at Chesterfield House in Talbot, hampers of market stall product, gift vouchers for local eateries and of course the renowned ‘Barrow’ overflowing with Market goodies. All prizes kindly donated by stallholders and local business go to show the great level of support the Talbot Farmers’ Market receives from its local community. Three little pigs were raffled in the Markets popular Pig Raffle with each winner being absolutely thrilled to have their ticket drawn from the bucket. Wendy Aston of Ballarat was very excited to have won one of the pigs. “It was a really great and successful day, a real credit to the Talbot Farmers’ Market and winning a piglet just topped it off!” said Wendy of her win. Wendy is going to have a friend join her on the new adventure of pig ownership, they will buy another pig as a companion and keep the two pigs on a farm just outside of Ballarat. Here they will roam free range in a grassy paddock and be well looked after with a straw lined house, shelter trees and space to wallow in. John Wright of Ragin’ Pigs will guide Wendy and the other winners through the steps of pig ownership and has offered to always be on call for support if required. John cares greatly about his free range rare breed black pigs and is happy to see the pigs going to three new caring homes. The Talbot Farmers’ Market information and raffle marquee in front of London House was adorned with balloons for the kids and a cake made by Bryce’s Bistrot to celebrate the milestone event. The cake was cut by Tiffany Titshall, one of the team of dedicated locals who founded the Market a decade ago. Following which an impromptu song of Happy Birthday was sung by Lindsay Hazelman with many in the street joining in. The day concluded with many stallholders having sold out of fresh produce and smiles on the faces of market goers having experienced yet another enjoyable day at the Talbot Farmers’ Market.